A wild idea turned into a project with a significant budget and a strictly limited time plan. SEK 65000 for a rail pass and twelve months to go see Sweden. My hypothesis was that it would all be doable with public transportation. Others might have rented a car now and then but I didn’t have that option. Boats, buses and trains it had to be. All in all, I made 44 journeys. I spent 95 nights on trains and in hotels. I used nine days of saved vacation time. It was an incredible year - here’s a recap. My biggest mistake was trying to travel cheap in the first months. It wasn’t until April that I finally had a hotel night. I certainly saved a dime or two but those winter trips were hectic and not very pleasant. The best idea I had was to throw in a series of brief summer night excursions. Using X2000 I was able to reach places like Linköping, Norrköping and Gävle, spend a few hours and then return to Stockholm with the last train watching the sun reluctantly set after another long summer day. Weather-wise I was remarkably lucky all year long. Very little rain, lots of sunny days but few of them really hot. You know me, I can’t stand the heat. And when it did rain cats and dogs, like in Bohuslän on October 22, I was already on my way back from Strömstad after a great day at Kosteröarna and didn’t really mind. Lucky guy. 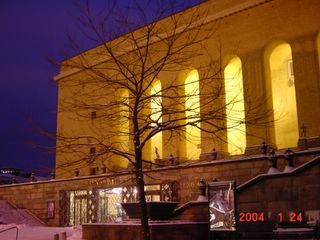 The worst day was the very first one, in Sundsvall. It was Epiphany and the entire town was closed. I spent half the day walking on slippery, icy sidewalks and the other half in a café that had somehow forgotten to close. On that day I learnt to do my research and be prepared. Bring a map, a list of phone numbers; always check opening-hours and connections. Have a plan A for good weather and an alternative one just in case. What a valuable lesson that was! Biggest disappointment? Got to be the fact that I missed Dalarna entirely. Unforgivable, really. I was planning to go there several times but something else always turned up. My rail pass was the golden version, enabling unlimited first class train traveling. Was that really necessary? Definitely. For example, there are several options for traveling from Stockholm to Malmö but this card includes a single compartment with my own toilet and shower on the night train. I can rely on a good night’s sleep; I won’t be tired upon arrival. On top of this, a hotel breakfast is included. I’ll be just as alert as if I had slept in my own bed and ready to make the most of the day. I could certainly have traveled less expensively but there’s no way I would have managed these 44 journeys in twelve months. My only companion was my digicam. I took thousands of pictures, a few of them can be seen in my galleries for northern and southern Sweden. It’s been a while now. I keep thinking about where I was and what I was doing at the same time last year. Great memories. There’s just one regret. I didn’t get to see all of Sweden. SJ doesn’t cover the entire country. There’s a lot to be seen north of Åre and Härnösand. So my project will have to be augmented. Somehow. Sometime. So, I found a snapshot on only a few of the trips. Where´s the rest ? Visby is a killer ;-) I love it ! The rest? Good question. The answer is: here and here! Yeah, right....;-) Missed that. Been there now, and I suspect that there could be a few more. Very nice selection though. Again.